As usual open access is showing strong growth in many directions; more open access archives, documents, journals, articles, and books. 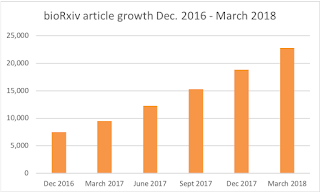 This quarter focuses on the large number of indicators of growth beyond the usual background growth of scholarly journals and articles of 3 - 3.5% per year. Newcomer bioRxiv, with 21% growth this quarter (equivalent to 84% annual growth) is far above this background growth. This quarter, DOAJ added a net total of 378 journals, or more than 4 journals per day, for a total of 11,105 journals. The number of journals searchable at the article level has increased by 236 for a total of 8,045 journals. The number of articles searchable at the article level is just under 3 million. The number of documents searchable through BASE grew by 3.5 million for a total of just under 24 million (about 60% of these, over 14 million, are open access). BASE added 121 content providers for a total of over 600 content providers. The percentage of PubMed records for a search for "cancer" that retrieve full-text is 27% overall, with a high of 45% for records published in the last 5 years. The percentage of full-text retrieval is rising at a steady rate. The overall growth rate for scholarly articles and journals has been fairly steady over the past few centuries, in the range of 3 - 3.5% growth annually (Price, 1963; Mabe & Amin, 2001). As noted in the following chart, in the past quarter alone there have been 43 indicators of growth above that level, at least 1% in the quarter (equivalent of 4% annually). This post is part of the Dramatic Growth of Open Access series. Full data can be downloaded from here.